A Ph.D. research assistantship is available (beginning summer 2018) in the Hardison lab at the University of Texas at Austin Marine Science Institute, (https://utmsi.utexas.edu/). This position will be a part of an interdisciplinary team funded by the National Science Foundation to study the biogeochemistry within the Beaufort Sea lagoons at a newly established LTER site. The student will focus on characterizing spatial and temporal patterns in benthic metabolism and biogeochemical cycling through field and laboratory activities. Applicants with a background in marine or aquatic chemistry, preferably with a degree in chemistry, biology, environmental science, or a closely related field, are preferred. The student will be involved in all aspects of the project, from field work in the Arctic to publication of findings. Applicants are expected to have a strong academic background, show evidence of independent work in the field and/or lab, and demonstrate a capacity to contribute to a collaborative research environment. For more information, please email a statement of interest/background and a copy of your CV to Amber Hardison (amber.hardison@utexas.edu). Note that the application deadline for our graduate program is December 1, 2017. Nick Reyna graduated in December 2016, earning his Master's degree from UTMSI. Nick's research focused on the influence of storm events on the quantity and composition of POM in a subtropical estuary, Texas. Nick's manuscript is currently in review in Frontiers in Marine Science. Nick was Amber's first graduate student (co-advised by Zhanfei Liu), and he's now working in the biology department at UT Austin. Way to go Nick! Arctic paper published in Nature Communications! Our work on nitrogen cycling in Arctic shelf sediments was recently published in Nature Communications! Nathan McTigue, a former postdoc in the Hardison Lab, led the effort. The College of Natural Sciences at UT Austin had a nice press release about the article. Great coverage for the lab! Very proud of this work. 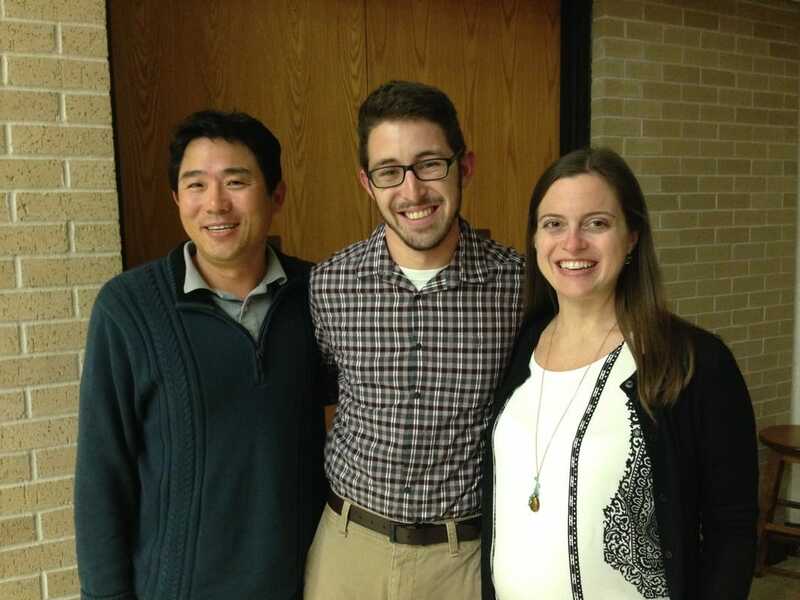 MS student Nick Reyna presented his first research poster on his work this semester. 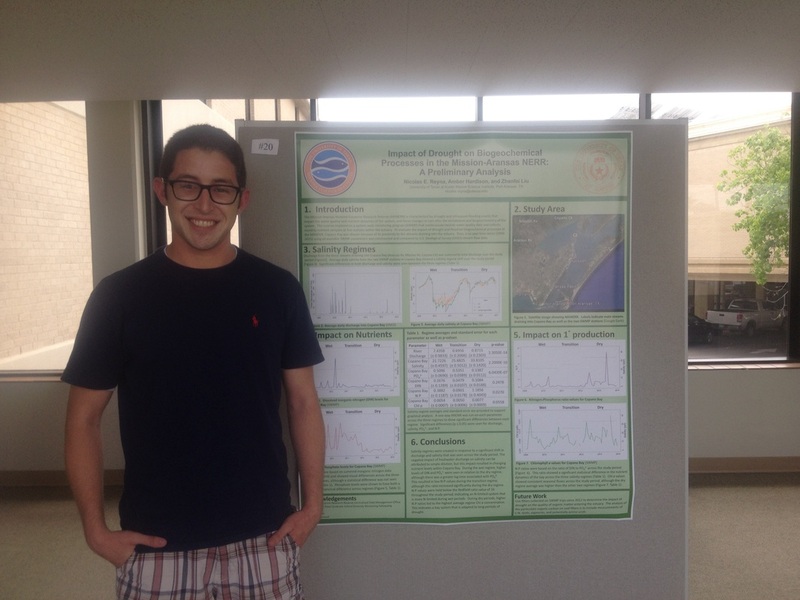 Nick presented his poster, entitled "Impact of Drought on Biogeochemical Processes in the Mission-Aransas NERR: A Preliminary Analysis," at the Texas Bays and Estuaries Meeting in Port Aransas, TX in April 2015. Great work, Nick! Grad student Nick Reyna finished his fall semester in Austin and has now moved to Port Aransas to start his research project. We're happy to have him in town and in the lab! Congratulations to UT undergrads Audrey Wohlrab and Veronica Aguilar for winning 1st place in the student poster category at the Gulf Estuarine Research Society (GERS) meeting in Port Aransas, TX! 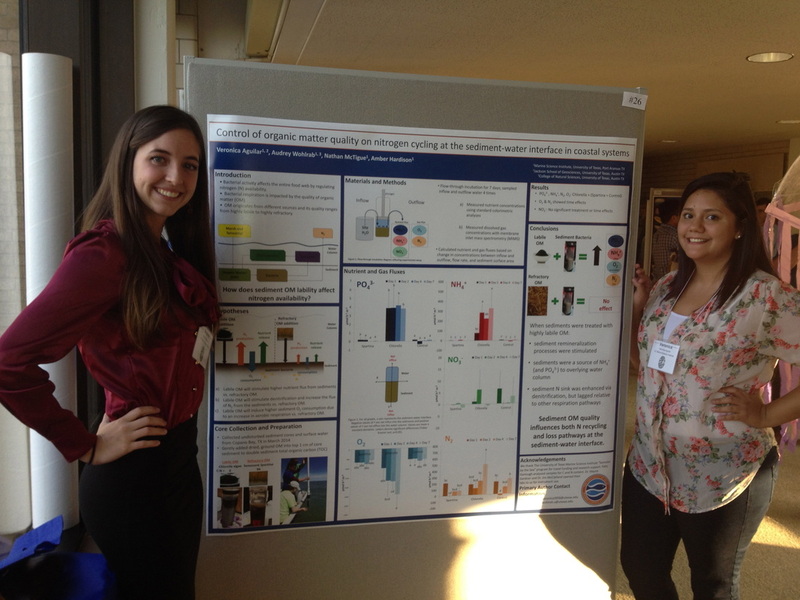 They presented their research conducted during the Semester by the Sea (SbtS) program in spring 2014 on "Control of organic matter quality on nitrogen cycling at the sediment-water interface in coastal systems." Their travel to the GERS meeting was made possible through funding they were awarded from the SbtS program. Way to go ladies! August, 2014: Amber gets an NSF project funded! See Research page for more info. August, 2014: Amber and co-instructor Zhanfei Liu start a new semester of graduate teaching: Marine Biogeochemistry. 10 eager students ready to learn all about chemistry in the ocean.